Wes Craven? Linda Blair? Witchcraft? 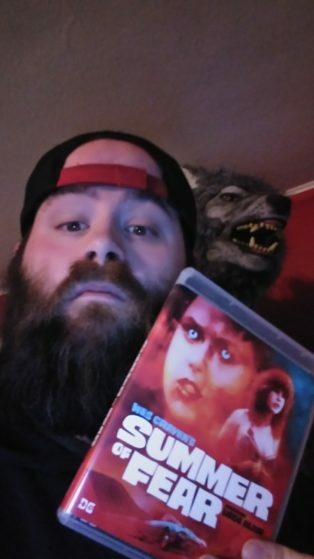 I don’t know about YOU but those three things definitely grab MY attention right away as a horror fan. What happens when Horror Master Wes Craven & Scream Queen Linda Blair work together on a movie made for TV based off a book from I Know What You Did Last Summer author Lois Duncan? It was more common back then for film projects to be produced for television rather than theaters. This collaboration was welcomed by the horror community considering both headliners previous work before this project included The Exorcist, Exorcist II: The Heretic (Depends on who you ask LOL), The Last House on the Left, & The Hills Have Eyes. At the time of this movie director Wes Craven only had two films under his belt (Three if you include his Adult film) so he was still developing his craft & Linda Blair only a did a few feature films at the time. She was mainly considered an TV actress after stuff like Hidden Faces, Born Innocent, Sarah T. – Portrait of a Teenage Alcoholic, Sweet Hostage, & Victory at Entebbe so this project was perfect for her. 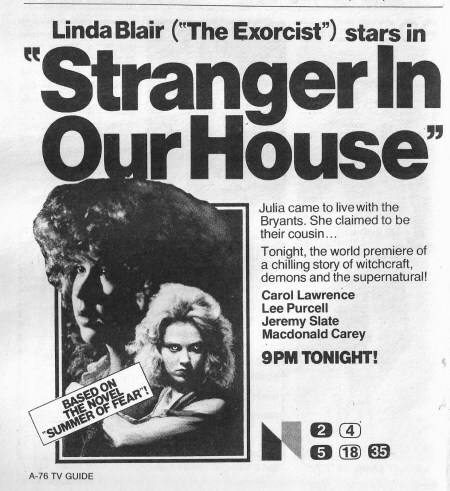 Summer of Fear aKa Stranger in Our House made it’s U.S./TV debut on NBC on October 31, 1978. It also received a theatrical release in the United Kingdom later on. 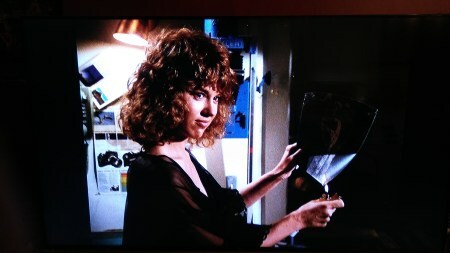 Linda Blair (Hell Night, Savage Streets, Chained Heat, Red Heat, Witchery, & many others) stars as teenager Rachel Bryant in this SUPERNATURAL drama. It starts out with a mysterious crash which puts everything in motion for this story. You learn that her cousin Julia Trent played by Lee Purcell (Necromancy, Valley Girl, & Mr. Majestyk) lost her parents in that “accident” so she moves in with Rachel’s family (Jeremy Slate from The Dead Pit/The Lawnmower Man, Carol Lawrence from Valley of the Dolls TV series, Jeff East from Superman/Deadly Blessing/Pumpkinhead, & James Jarnigan from The Sword and the Sorcerer). It doesn’t take long for things to get STRANGE around there with the arrival of new house guest. Rachel’s horse Sundance goes CRAZY & tries to attack Julia which forces her family to move the animal. Rachel has been preparing for a school dance for awhile but she breaks out in hives right before it so she is unable to attend so her cousin Julia ends up going instead wearing the custom dress she made for herself. Rachel discovers wax figure her horse’s hair in Julia’s belongings while she’s gone & also finds out that Julia was all over boyfriend Mike at the dance then they left together early. The next day, Sundance loses control once again while Rachel is riding which causes a FATAL “accident” to the beloved pet. All of these recent suspicious events causes Rachel to look more into her cousin’s stuff when she finds a stolen picture of herself with hives drawled all over her. Rachel confronts Julia about her unusual behavior & says she thinks she’s performing WITCHCRAFT around the family to cause all this trouble so she’s going to friend for help. Julia knows who that it is & soon after Professor Jarvis has a “stroke” then he is rushed to the hospital. Rachel does some detective work & looks into Julia’s past. She discovers Julia has a BIG secret no one in the family knows about. Rachel visits Jarvis & he tells her what to look for to prove that Julia is a witch. Julia also starts to seduce Rachel’s father & her mother starts to notice she’s up to no good with this family. Julia’s image doesn’t appear in photographs & there’s no reflection in the mirror which leads to the FINAL confrontation between the two main characters! It’s GREAT to see more horror television get resurrected in high definition. I recommend this for Wes Craven & Linda Blair completest, this is an solid addition to any collection. It’s more of a drama with some thrills & supernatural mixed in but it holds up after all these years. This NEW Blu Ray from Doppelgänger Releasing BLOWS AWAY the original 2003 DVD from Artisan! For a late 1970s television movie it looks BETTER than I’ve ever seen it before. Don’t expect reference quality (1.33.1 Fullframe with flecks, specks, & scratches show up all the way through) for this but you will be impressed by it’s high definition presentation for what it is. For an older TV movie, the sound/audio is WAY better than expected. Now, let’s talk about the special features. Honestly, the late great Wes Craven’s (A Nightmare on Elm Street, Swamp Thing, Deadly Friend, The Serpent and the Rainbow, Shocker, The People under the Stairs, New Nightmare, Scream, & many others) commentary with co-Executive Producer/writer Max Keller (Deadly Blessing, Acapulco H.E.A.T., Conan TV series) on this disc is probably more interesting than the actual film. He’s full of intelligence & gives out plenty of information to keep you entertained through out the feature. Linda Blair shows up for an exclusive 13 minute interview about her experience on Summer of Fear. That extra alone is VERY impressive because Linda Blair rarely participates on bonus material for her previous work. Also included is an image gallery & the original trailer. Doppelgänger Releasing is definitely grabbing the attention of all movie collector’s these days with their releases of 100 Bloody Acres, Eddie: The Sleepwalking Cannibal, & Evil in the Time of Heroes. I HOPE to see more horror television films like this in their future!